Our technological culture too often takes its standard of development to be “marginally better consumer gadgetry” (Williams & Srnicek). It takes some effort to puncture the hype and discern what are the leaps and bounds of real innovation. To not only be a new media technology in the sense of recently coming into existence–a rather banal definition, like calling what one throws into the garbage “new” trash–, but also new media technology in the sense of newly redefining what can possibly come to count as a medium, what expands our understanding of what it means to “mediate”. One can easily be forgiven for taking the announcement (Caughill) earlier this month from South Africa’s University of the Witwatersrand, Johannesburg (“Wits University”) as an example of the former. The report tells of biomedical researchers in the School of Electrical and Information Engineering who used a Brain-Computer Interface (BCI) system to digitally stream electroencephalogram (EEG) signals (electrical “brain waves” that brain cells constantly produce to communicate with each other) on the internet (“Electroencephalography”). On the face of it, there doesn’t seem to be anything “emergent” about such a feat, despite the Wits researchers’ claim that their “Brainternet” project has reached a unique milestone on the world stage. BCI technologies have been researched and developed since the early 1970s (“Brain-computer interface”), and physical networks linking devices and objects to the World Wide Web for the digital capture and communication of data–first termed the “Internet of Things” (IoT) back in 1999–are anything but new (“Internet of things”). Summary of the announcement’s detailing of the feat (Minors). An Emotiv EEG headset device is placed upon a person whose brain waves are being detected and encoded by the headset. The headset device records the physical electric waves into a digital format that it then transmits to a credit-card sized computer (the Raspberry Pi) on a table near to the person. The computer uses something called an application programming interface (API), code that enables software belonging to nodes on the internet to communicate with each other, to send this bioinformatic data to a website that visualizes records of the person’s brain waves live. The web site was open to public observation of real time emissions, effectively meaning that for the first time in history a human being’s brain is a networked node in the computational mesh of the Internet of Things. But it goes further. The lecturer supervising the research gestures towards the technology’s current reaching for future developments, including creating a cell phone app to index recordings of brain waves as data feeding a machine-learning algorithm that makes sense of their patterns (Minors). There was no mention in the press release of what sorts of categories were being classified, nor what ends are being sought when this data is being fed to a learning-capable technology. Also intriguing and open to critical inquiry is the team’s long-term goal of moving from their recently created one-way brain-to-headset output to a two-way communication system that would additionally treat the brain as an input receiving node (Minors). A stunning goal for the project, one whose implications and consequences could realize the familiar trope in science fiction literature–as explored, for example, in the brilliant novel Neuromancer by William Gibson, who invented the term “cyberspace”–of human cognition achieving degrees of computerization through contact with networked information and communication technologies. Another node in the global–actually galactic, counting extraterrestrial IoT nodes belonging to satellites and other objects–network. Cue: the 80s neons and virtual Tron-like spaces of the vaporwave aesthetic. “Just as the invention of the stock market was also the invention of the crash, [we know] that technological innovation must equally anticipate its systemic condition responsively” (“Xenofeminism” 0x08). In other words, the Brainternet’s planned development of its research program throws up way more questions than answers about what this emerging technology is making possible, for better or for worse. Brain cells communicate information through electrically pulsing signals to other brain cells to initiate or respond to all kinds of activities, ranging from mood to bodily movements to abstract thinking (“Electroencephalography”). If human brains are to become nodes that interoperate with other nodes–including possibly each other!–in the IoT in two-way communication, then brains become open to receive electrical signals bearing data of many possible sorts. This incoming data that these electrical signals emit to brain cells would modify brain activity, possibly even to the point of exerting control over brain function. Moods changed, neurological diseases like Parkinson’s treated for biochemical irregularities, memories transformed–just some of the possibilities if the bioinformatic engineering holds it out in practice. Of course, this raises a host of questions. Some are more general or classical: Who controls access to the technology, and for what purposes? Are those ethically problematic, requiring a different approach to relate to the new technology? Others, are more specific to the Brainternet project and current media ecologies: What are the privacy issues at stake in the project’s planned path of research and biomedical engineering? How will the brain-as-node interact with Big Data societies? What are the potential uses and abuses of gaining the capacity to modify or influence or control brain cells’ communicative activity? Will there be transparency about the particular ends the machine-learning algorithm is recording brain waves for? As the many questions indicate, the Brainternet project steps into long-standing debates about technoscience and society, while revising the parameters for their discussion to include new elements for consideration. Although the range of myriad implications and possibilities prohibits exhaustive analysis (especially given the still-emergent nature of these technological developments), it’s helpful to look to debates around specific technologies like the brain-computer interface and the Internet of Things. They help to begin orienting and informing our responses to these core social questions that have direct bearing on the quality of human lives. The Brainternet project invites many questions. In an era where data are being collected and commodified in a capitalist “information economy,” much of the literature focuses upon how the Internet of Things relates to issues of privacy and ownership surrounding data capture. Do users own the captured data from their online and offline activities, or do corporations provision of services give them property rights over the data to do with as they please? What happens when uses of IoT technologies meant to benefit the human conflict with corporations uses for-profit motives? A specific example includes the possibility of “ethically designing” devices connected to the IoT to enhance privacy protections–but for a price (Baldini et al. 5). This “ethical design” would be sold as a service for users to opt-into greater data protection than is the legal or de facto norm. This economic model transforms property rights over individuals’ data into a two-tier social hierarchy favoring class privileges for enhanced data protection. This leaves impoverished individuals vulnerable to information’s commodification guided by the profit incentive. Concerns for jurisprudence arise as well, as legal systems must grapple with inventing judiciary standards to adjudicate contested uses of technology. For all potential Brainternet users to have privacy protections for their access to health and other services within emerging media ecologies, models of privacy and data protection must be sensitive to what situations and scenarios rise with new technologies. For example, Big Data analyses create different kinds of collective groups than traditional social categories and identifications like gender and race (Mantelero 254). These new groups are instead defined by new technologies to make meaningful captured and aggregated data and meta-data in new ways, revealing patterns not detected by perceptive human cognition. This has the side effect of making unclear what the criteria are for group belonging, and whether members grouped by data analytics have common interests worth their knowing about. Moving from individualist assumptions about privacy protection, jurisprudence has to account for the reality of collective legal data subjects requiring representation and protection from invasive technologies of control. Using the example of BCI-enabled neuroprosthetics in the larger field of Health-related IoT (H-IoT), Clausen asks: “Who would be responsible for a prosthetic movement based on erroneous computational predictions?”(Clausen 432). Although the question of responsibility is posed for a computational misinterpretation of a brain’s communication output, the question gains a gravity when we remember two-way communication. Can other nodes in the IoT become legally responsible for neurophysically modifying a brain’s activity from afar? Could such maneuvers overtax cognitive capacities? Shouldn’t the only uses of BCI technology for a H-IoT be for ends of maintaining human health and well-being, the very point of medical institutions (Mittelstadt 5)? Or take the health of soldiers potentially using the US’ DARPA’s (Defense Advanced Research Projects Agency) “Silent Talk” project currently in development. “Silent Talk” aims to facilitate brain-to-brain non-verbal communication in combat situations. (Telepathy, another of sci-fi’s greatest hits, makes a guest appearance) Does the altering of their neuroelectrical activity, and associated behaviors and personalities, threaten the safety and health of themselves and others in both short- and long-term (Kotchetkov 4)? To conclude, although it is still unclear what further developments will be technically feasible for the Brainternet’s BCI-IoT mash-up, potential implications for its flows of data inputs and outputs raise both promising avenues for medical therapy and human health as well as more dystopic routes threatening to undermine individual and collective autonomy and well-being. The pressing issues that debates about these technologies make salient require thinking about their ethical import for achieving the former rather than the dominance of the latter. Baldini, Gianmarco, et al. “Ethical Design in the Internet of Things.” Science and Engineering Ethics, 2016, doi:10.1007/s11948-016-9754-5. Accessed 23 Sept. 2017. Caughill, Patrick. “Researchers Have Linked a Human Brain to the Internet for the First Time Ever.” Futurism, www.futurism.com/researchers-have-linked-a-human-brain-to-the-internet-for-the-first-time-ever/. Accessed 14 Sept. 2017. Clausen, Jens. “Bonding Brains to Machines: Ethical Implications of Electroceuticals for the Human Brain.” Neuroethics, vol. 6, no. 3, 2013, pp. 429–434., doi:10.1007/s12152-013-9186-8. Accessed 23 Sept. 2017. Cuboniks, Laboria. “Xenofeminism: A Politics for Alienation.” www.laboriacuboniks.net/. Accessed 24 Sept. 2017. Kotchetkov, Ivan S., et al. “Brain- Computer Interfaces: Military, Neurosurgical, and Ethical Perspective.” Neurosurgical Focus, vol. 28, no. 5, 2010, pp. 1–6., doi:10.3171/2010.2.FOCUS1027. Accessed 22 Sept. 2017. Mantelero, Alessandro. “Personal Data for Decisional Purposes in the Age of Analytics: From an Individual to a Collective Dimension of Data Protection.” Computer Law & Security Review: The International Journal of Technology Law and Practice, vol. 32, no. 2, 2016, pp. 238–255., doi:10.1016/j.clsr.2016.01.014. Accessed 21 Sept. 2017. Minors, Deborah. “Can you read my mind?” University of the Witwatersrand, Johannesburg, www.wits.ac.za/news/latest-news/research-news/2017/2017-09/can-you-read-my-mind. Accessed 22 Sept. 2017. Mittelstadt, Brent. “Designing the Health-Related Internet of Things: Ethical Principles and Guidelines.” Information, vol. 8, no. 3, 2017, p. 77., doi:10.3390/info8030077. Accessed 24 Sept. 2017. MrSandman. “This is a screenshot of a polysomnographic record (30 seconds) representing Rapid Eye Movement Sleep. 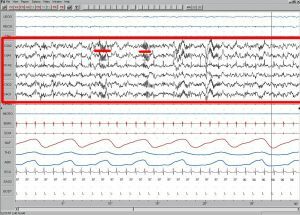 EEG highlighted by red box. Eye movements highlighted by red line.” Wikimedia Commons, 19 September 2005, www.commons.wikimedia.org/wiki/File:Sleep_EEG_REM.png#/media/File:Sleep_EEG_REM.png. Accessed 23 Sept. 2017. Wikipedia contributors. “Brain–computer interface.” Wikipedia, The Free Encyclopedia. Wikipedia, The Free Encyclopedia, 30 Aug. 2017. Accessed 23 Sep. 2017. Wikipedia contributors. “Electroencephalography.” Wikipedia, The Free Encyclopedia. Wikipedia, The Free Encyclopedia, 19 Sep. 2017. Accessed 23 Sep. 2017. Wikipedia contributors. “Internet of things.” Wikipedia, The Free Encyclopedia. Wikipedia, The Free Encyclopedia, 24 Sep. 2017. Accessed 22 Sep. 2017. Williams, Alex, and Nick Srnicek. “#ACCELERATE MANIFESTO for an Accelerationist Politics.” Critical Legal Thinking, www.criticallegalthinking.com/2013/05/14/accelerate-manifesto-for-an-accelerationist-politics/. Accessed 24 Sept. 2017. Winter, Danielle. “ELEN4002 Brainternet Video.” Online video clip. YouTube. YouTube, 17 Sept. 2017. Accessed 23 Sept. 2017. Has Apple Destroyed the Internet?